NEXT events in Collaboration with ORMS are hosting an event photography exhibition at Carnival Court (Long Street, CT) on Thursday the 24th of March. 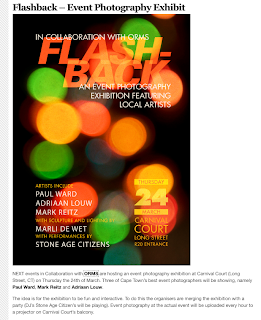 Three of Cape Town’s best event photographers will be showing, namely Paul Ward, Mark Reitz and Adriaan Louw. The idea is for the exhibition to be fun and interactive. To do this the organisers are merging the exhibition with a party (DJ’s Stone Age Citizen’s will be playing). Event photography at the actual event will be uploaded every hour to a projector on Carnival Court’s balcony.